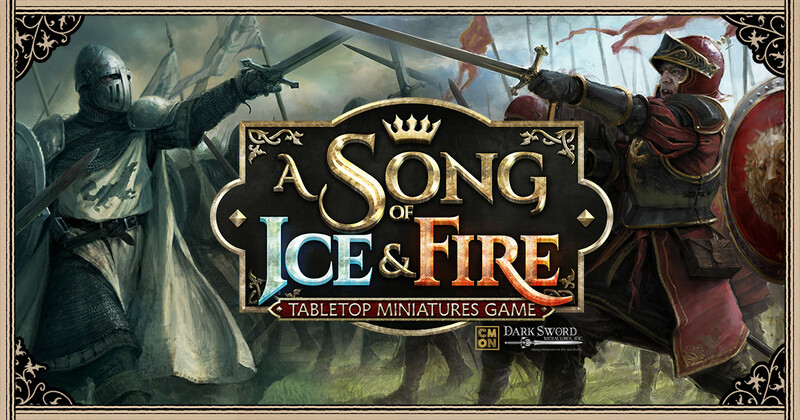 Tuesday, March 14, 2017 – CMON Limited is proud to announce its exciting new project A Song of Ice and Fire: Tabletop Miniatures Game based on the beloved novels by George R.R. Martin in cooperation with Dark Sword Miniatures, Inc. Heading to Kickstarter in Q3 of 2017 and retail stores in 2018, this new miniatures wargame allows fans to enter the world of the novels and control units of troops and heroes with easy to pick-up rules and fast-paced, brutal gameplay. Since the A Song of Ice and Fire series was first published in 1996, fans from around the world have fallen in love with the amazing lands of Westeros and Essos and the iconic characters that inhabit them. CMON’s new tabletop miniatures game brings the conflicts set in those lands and the beloved characters to life with gorgeous, pre-assembled miniatures that make picking up and playing the game a breeze right out of the box. Gameplay is strategic yet easy to learn, meaning players will get to the battles as quickly as possible. CMON is excited to reveal the game during the GAMA Trade Show 2017 and will have even more information before the launch of the A Song of Ice and Fire: Tabletop Miniatures Game: Stark vs Lannister Starter Set on Kickstarter later in 2017, with a healthy lineup of regular retail releases and support to follow. Dark Sword Miniatures, Inc. is a privately held producer of multiple award-winning miniatures and miniature related products. Dark Sword was originally founded in 2002 to produce premium pewter gaming miniatures based on the artwork of famed fantasy artists Larry Elmore, Keith Parkinson (RIP), Clyde Caldwell, and Jeff Easley. Over the years, other artists and creators such as Stephanie Law, Tony DiTerlizzi, and George R.R. Martin have joined forces with Dark Sword to create miniature related products based on their works. To learn more about Dark Sword Miniatures, visit www.DarkSwordMiniatures.com.